We’ve been enjoying the warm summer breezes for two weeks. This is worth mentioning because 1) we live in Wisconsin, and 2) this is March, when normally we’re still shoveling snow on a regular basis. My workload is heavy right now (not a bad thing), so for the most part I’m enjoying those toasty breezes as they waft through the open windows, ruffling the stacks of notes as I edit. 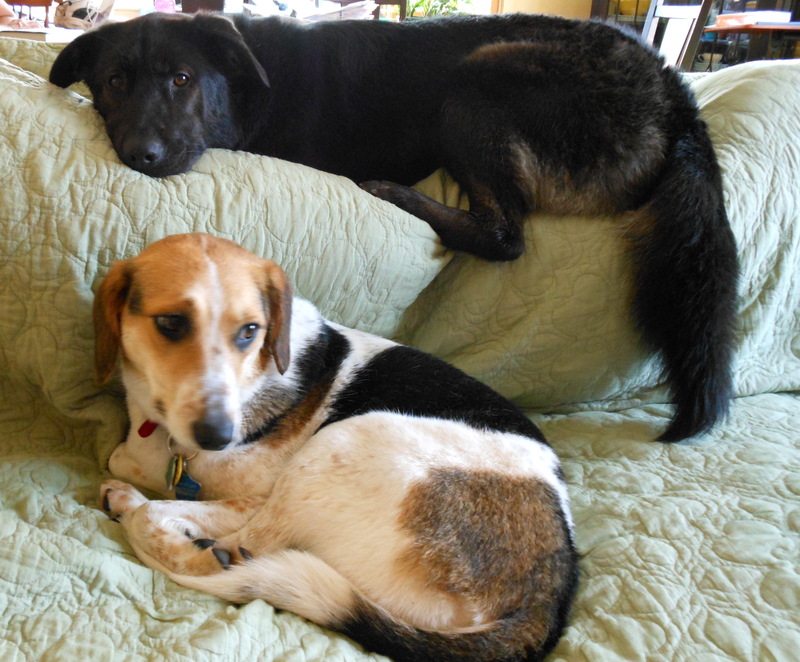 The girls have been pretty darned patient so far, but they’re overdue for a trip to the dog park. Libby and Cleo rearranging the couch cushions to their liking. In order to justify a trip outside, I needed to make the most of my morning time. This means making lunch as quickly as possible. I also wanted that speedy lunch to be healthy and delicious, of course. These great intentions are complicated by a severe lack of fresh produce at the moment. Here’s where having a well-stocked pantry and freezer come in handy. 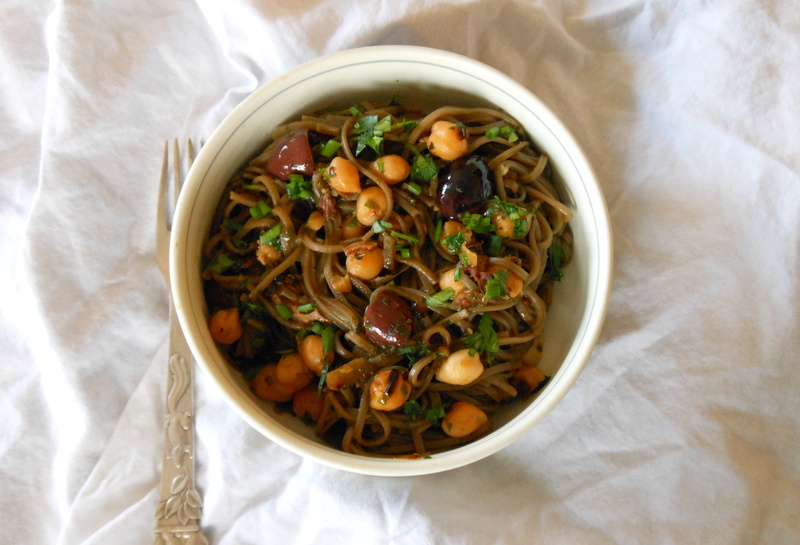 I pulled out a can of chickpeas, some soba noodles, and an onion — all nutrition-packed ingredients — and garlic, black olives, and pesto for flavor. This dish is based on the Italian dish pasta e fagioli, or pasta with beans, substituting toasted chickpeas (one of our favorite munchies) for the beans. Toasting the chickpeas makes them creamy on the inside and slightly crunchy outside, and brings out a subtle smoky flavor. You could use any pasta for this dish, but the buckwheat soba noodles have more flavor than regular pasta, and they cook in just a few minutes; so quickly, in fact, that I recommend finishing the sauce before you put the noodles in the boiling water. For color and herbal goodness I added pesto (homemade, frozen in ice cubes) and fresh parsley from the bunch sitting in a glass on my counter. Quantities here are completely up to you. This is a throw-together dish. Use green olives if you don’t have black. Add a handful of chopped, toasted walnuts to enhance the nutty flavors. If I’d thought of it, I’d add a carrot cut into ribbons with a vegetable peeler. The crowning glory: snipped fresh chives from our very own patch. Never have they grown so early. What a treat! 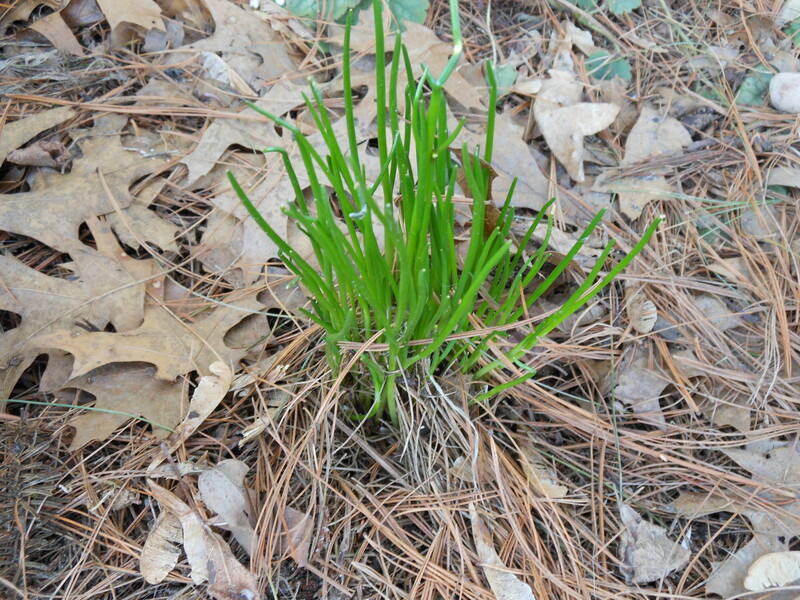 This was actually taken in early March; they're a foot tall now. Put a big pot of water on to boil for the noodles. Meanwhile, sauté the onion, garlic, and aleppo in the oil over medium heat until softened. 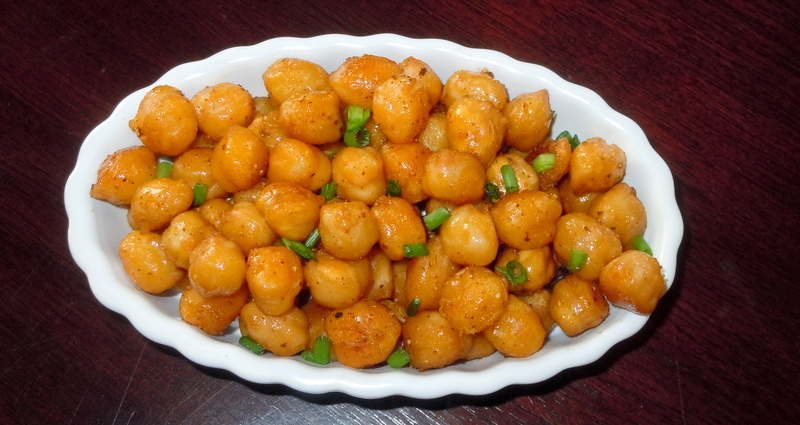 Add the chickpeas, season lightly with salt, raise the heat to medium-high, and cook, stirring frequently, until the onions are browned and the chickpeas are toasty. Season with pepper. Stir in the olives, pesto, and stock. Reduce heat to medium-low and simmer while you cook the noodles. Add a good amount of salt to the boiling water and stir in the soba noodles. Cook for about 4 minutes until they’re still just slightly chewy. Lift them out of the pasta water and add to the chickpea mixture. Raise the heat to medium-high and cook, stirring to combine everything, until most of the liquid has been absorbed and the noodles are cooked through. This should only take a minute or two. Add more stock or a spoonful of the pasta water if the noodles are too dry. Sprinkle with the parsley and chives and serve hot. This entry was posted in main courses, pasta, rice, and grains and tagged buckwheat noodles, chickpeas, garbanzo beans, healthy, olives, pasta, quick, soba noodles. Bookmark the permalink. I can’t wait for my new kitchen so I can try all of your recipes. I started following your blog just after we started demolition. Thanks, Peg. A new kitchen–I’m jealous.